September marks the start of dove season in the mid-Atlantic region, as the doves take to the skies for their seasonal migration. Freedom Alliance was on the move as well to make sure our troops took advantage of the action. Porter Hopkins, a Korean War veteran and past member of Maryland’s General Assembly, invited Freedom Alliance to bring some military friends out to his Chesapeake Bay farm for the second year in a row. 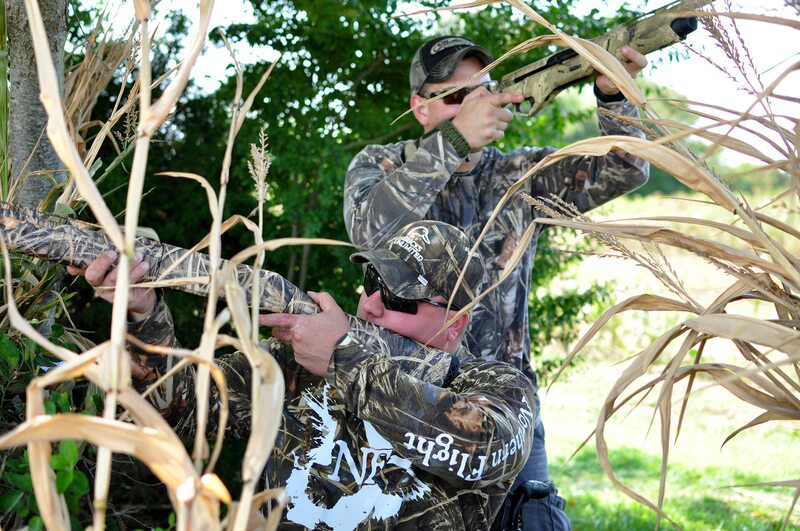 Medically retired Army soldiers joined Marines from Walter Reed for an ideal day of shooting and outdoor sports. 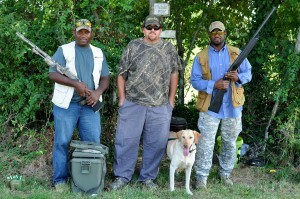 Mr. Hopkins wanted the service members to be the first to hunt doves on his prime property as soon as the season officially opened. Keniel and Denny represented the U.S. Army, with more than thirty years of service between them. Keniel, who we call “Kenny,” is recently disabled after a devastating motorcycle accident. At a Freedom Alliance event a few years ago, he developed a passion for archery, and since has competed in Paralympic tournaments. Kenny introduced us to his buddy Denny, who, during multiple combat deployments, was shot in the hand and also injured his head while in the turret of an armored vehicle. This Louisiana native was eager to meet with other patriots and outdoorsmen during the hunt. A couple of Marines also joined the forces for some friendly competition. Jon was serving in Afghanistan when an explosion took his right leg below the knee. We first met him in the hospital when we promised his father that we would get Jon to the outdoors as soon as he was physically able. We kept that promise, and continue to have the honor of including this Marine in our outings. Jon’s friend Christian, a Silver Star recipient, lost both legs above the knees to a blast while serving in Afghanistan. 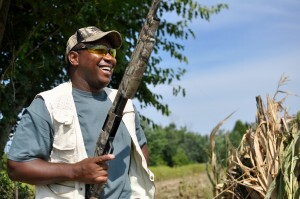 His disability doesn’t stop him, however, from enjoying sporting events, such as this dove hunt. At the end of the day, eighty-seven birds went down, taken by the troops and volunteers. Once we were all wrapped up, the American Legion Post #91 invited the Freedom Alliance guests to their digs for a steak and crab dinner. *See recipe below for a dove breast marinade. 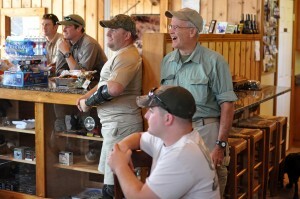 The very next day, Freedom Alliance founder Lt. Col. Oliver North invited some Walter Reed patients to Summerleas Hunting Preserve in Rapidan, Virginia. 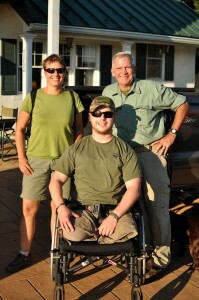 The hunting lodge is owned and operated by Duane Gardner, who recently served in Afghanistan, and his family. Colonel North and friends met the troops from Walter Reed, and then rode out in convoy to beautiful Summerleas for a fried chicken lunch, followed by hunting. Liaisons from Walter Reed, Sergeant First Class Jon and his assistant Sergeant Dustin of the 82nd Airborne, brought with them a fine crew of recovering service members. Jon himself was wounded by an AK-47 round to the face, from which he lost an eye. 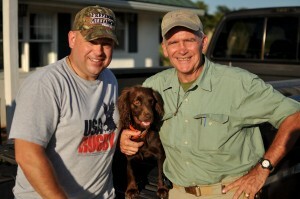 In addition to the soldiers, he brought his lovable service Labrador Retriever, Willie. 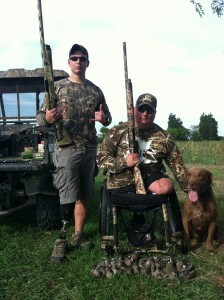 Serving with the 82nd, Matt is now a single amputee, and Jordan lost both legs below the knees. Adam, an Army combat medic from Pennsylvania, had both legs amputated above the knees after an explosion just this May. Another soldier, Monte, lost three limbs on Independence Day last year. Also in attendance was Major Richard, a V-22 Osprey pilot, who lost his leg when the aircraft went down during a training operation overseas. At the commencement of the hunt, the troops—some in wheelchairs, and some using prosthetic limbs—lined up along a shaded drive that overlooked the open fields, waiting for the doves, which seemed reluctant to make an appearance. Nevertheless, fifteen doves were taken by the end of the day. Major Richard even shot three doves with four shells, surprising us with his accuracy. Colonel North, along with his Boykin Spaniel, Casey, spent the afternoon getting to know his guests and hearing their stories. He signed copies of his book Heroes Proved for the men to take home to remember their hunt by, showing them the honor on which Freedom Alliance is founded. Mix well and marinate for at least six hours. Cook on a hot grill until done. Serve thinly sliced.